My husband and I met in college in Austin. When we first started dating, he lived in a decent apartment with three other guys. They decided they wanted a little more square footage and moved to a small house in DA HOOD not long thereafter. My husband and I regularly debate how hoodish it really was with him believing it was less so than me. So, anyway, he lived there. It really doesn’t matter for the story’s purpose that he lived in a kind of scary location, but I wanted to share it with you anyhow. Sets the scene, you know? He lived there with those same three guys who happened to all be home with some other friends when I went to visit around the spring of 1996. We hadn’t been dating that long and I didn’t really know his roommates all that well yet. They were all watching sports of some sort on TV when I needed to go into the restroom to WASH MY HANDS. I didn’t even use the bathroom. Someone else did, though, if you know what I mean. Someone who left behind some, ahem, how shall I say it…evidence at the bottom of the toilet bowl. Okay, skid marks. I’ll just say it. They left SKID MARKS. I was mortifed. 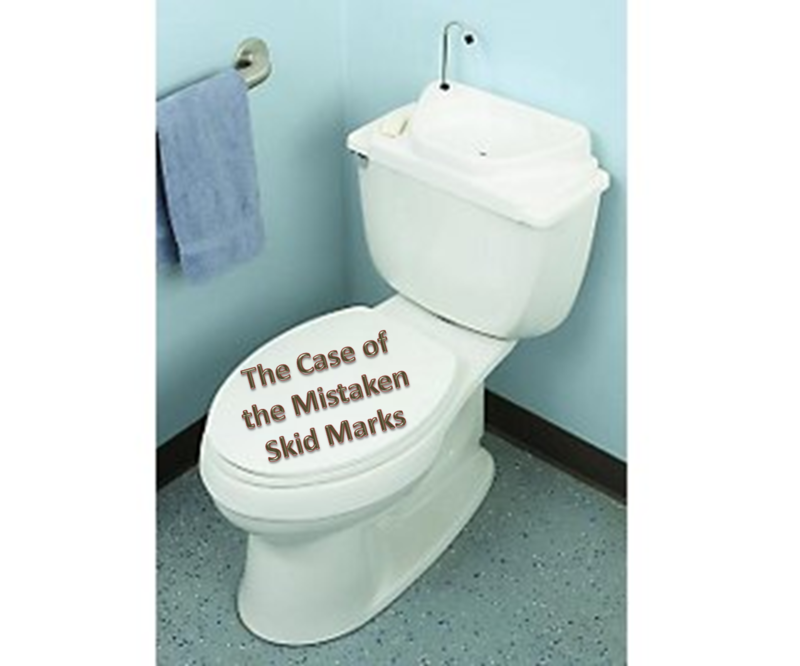 If I walked out of the bathroom with skid marks at the bottom of the toilet, the next person that came in there would think it was me. MY THEN-BOYFRIEND’S ROOMMATES AND THEIR FRIENDS CANNOT THINK I LEFT BEHIND SKID MARKS. What was I supposed to do??? Do I clean said skid marks? BUT THERE WAS NO TOILET BRUSH BECAUSE THESE ARE GUYS AND THEY DON’T OWN TOILET BRUSHES. One of the mothers of one of the roommates actually cleaned the bathroom whenever she visited FROM DALLAS. I’m pretty sure that was the only time that toilet got cleaned out and you know she didn’t visit every week. I wasn’t reaching my hand down in that water to scrub them off either. The only thing I could think to do was rush out, whisper about my discovery to my boyfriend, have him go in there and then come out. Then if anyone made the discovery, they would think he did it. Guys are shameless about their skid marks. Obviously. All game related chatter and noise immediately ceases. Somehow this conversation has been noticed by guys who were, seconds before, completely engaged in the game on TV. All at once, all the guys (not a single girl in there but me) in the room begin to laugh. And laugh. And laugh some more. He got the look. I. WAS. SO. EMBARRASSED. I can take a joke and be the joke, but not when it comes to whether or not those skid marks were mine. It’s kind of like when someone destroys a toilet stall right before you enter, they disappear like a ninja, you emerge from your rose-smelling stall, go to the sink to wash your hands and then someone enters the restroom. THEY DON’T REALIZE THE ROSE-SMELLING STALL BELONGS TO YOU AND THE AARDVARK-IN-HEAT-WITH-AWFUL-B.O.-SMELLING STALL BELONGS TO THE NINJA. It’s terrible. Really tragic. Equally tragic is knowing one of those guys not believing that my boyfriend was joking and thinking that I left those skid marks that day. I mean, honestly, is there anything more devastating in all the world?